You are Iron Viz, we heard you roar! Every Iron Viz competition brings out the best in the community, and Iron Viz on Safari was no exception! We had 52 incredible entries, including a whopping 44% of entries from Iron Viz newbies. And what's even better is that 9 entries came from countries where Iron Viz is brand new - 8 from India and 1 from China. What a spread! When we asked you to look for animal- or plant-related data sets for this Iron Viz feeder contest, even we were surprised at the diversity of data you used. We received every imaginable animal kingdom entry - from industrious insects to towering trees, from roots to feathers, fins to feet. You showed such imagination - the results are breathtaking. For this feeder contest, we said goodbye to the Twitter Crowd Favorite category, but we've added a new honor: the Iron Viz Best Rookie! Rookie honors go to Becca Cabral, for her black footed ferret viz, "You are my BFF"! This is the first Iron Viz competition Becca has entered - and she really pulled out the stops on this entry about North America's rarest mammal. Becca's deft use of straightforward charts, clean graphics, and thoughtful storytelling elements convinced the judges that she's someone to watch! But, as we always say at this point in the announcement...there can be only one winner. Tristan Guillevin takes home the big prize for his data story, "A Tale of Rainforest"! Tristan will be representing from Strasbourg, France on the big stage at TC17 in Las Vegas. He'll join Joshua Milligan, the Iron Viz: Geospatial winner along with the winner of our final Iron Viz feeder (coming soon!) to battle it out in front of thousands of data people. Tristan's viz took a different approach to storytelling - by breaking the fourth wall and engaging the audience directly. He took time with the small details to engage the audience carefully, from simplifying charts to cleverly incorporating sound. 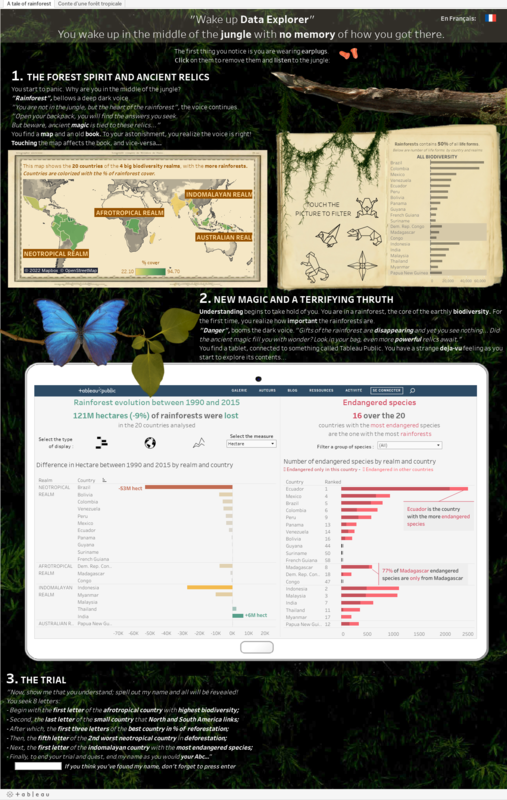 By using maps, charts, filters and parameters, he created an in-viz scavenger hunt to teach us more about biodiversity, and let's not forget about that spirit animal! Thanks to everyone who participated in this 2nd Iron Viz feeder contest, and congratulations to Tristan - we'll see you on stage at TC17 in Las Vegas! Remember, the third and final Iron Viz feeder is coming up fast - don't forget to register your interest to be notified when the next contest opens!